Lose those coats and tails, and go full-on desi at Dhaba by Claridges. 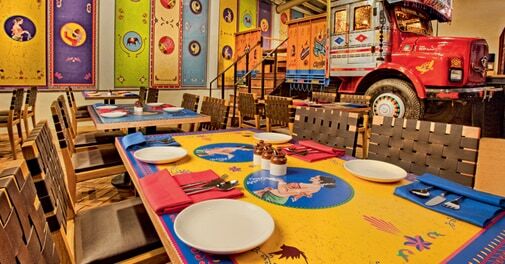 With copper utensils, gaudy lights and even an authentic truck, Dhaba by Claridges is as Indian as it gets. Roadside dhabas have long been satiating the appetite of many a traveller, and if that's an experience you have missed out on, Dhaba by Claridges is where you should be heading this very moment! There's a lot to admire here - a real truck, copper utensils, gaudy lights, funny one-liners, and a bar called theka. The dÃ©cor is unabashedly Indian and the food only takes it to the next level, transporting you to a full-on desi world. Very rarely does a restaurant manage to make its vegetarian dishes comparable to - or even better - its non-vegetarian fare, and Dhaba by Claridges is a fine example of that. For instance, the starters here seem like they are in a perfect neck-to-neck competition. The veg galouti kebab makes you forget the non-veg one, and the bhune aloo and vada pao are perfect palette setters. 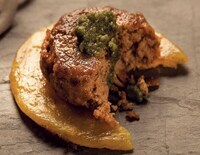 But meat lovers can't complain either, with the bun omlette, dhaba murgh roast and tawa mutton hitting all the right notes. I do wish the dhaba prawns were better, but - looking at the bigger picture - that's just a minor glitch. For the main course, the veg vs non-veg battle gets even more delicious (pun intended!). Try the daal dhaba and kanastari baingan bharta, and you'll know just how well these two match the meaty fares. Ravenous meat lovers can savour the tiffin chicken, balti meat and brain masala (don't freak out and just try it! ), the only underwhelming recipe being the dhaba chilli chicken. No meal is ever complete without the drink to complement it, and the theka here is in full flow. Whether it's the somras, toofan or the basanti, the drinks are as quirky in taste as in flavour. And you just cannot leave without trying out the pan mojito! A restaurant worth all the hype it creates, Dhaba by Claridges is a must visit for every true-blue Indian gourmand.